9000 may be touched soon, but Nifty is looking a bit stretched. This has happened after Trump speech. This can be said as emotional reaction to his emotional speech. In my experience stock markets do not run on emotions for long. 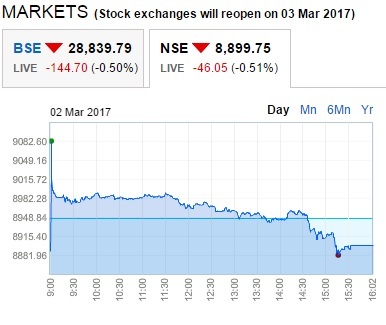 Once 9000 is breached, a lot of people will start booking profits and Nifty may fall. So chances of fall after 9000 is breached is more than Nifty crossing 9100. Because in the ground there is no dramatic change in the profit statements of most companies. In fact in India after the demonetization of Rs.500.00 and Rs.1000.00 notes many companies suffered losses or got lower business than usual. Things are normal now, but it will definitely show in the next two quarterly results. GDP will also come down this financial year. Disclaimer: This is not an investment advice to go short in the markets. I am not an investment advisor. If you want to take any investment decision please do thorough research before investing in any stock or take advice from authorized investment advisors. Stock markets investments are subject to market risk please invest with proper research. Even if you want to trade on your own it is better to get good education in stock trading and then trade properly. Of course like our school and college education, no good education comes for free. Its good to invest to learn and trade or invest, rather speculate and invest. 1. Conservative Option and Futures Trading Course for Short Term Derivative Traders. 2. How To Invest Well & Retire Rich for Long Term Investors. If you are interested to know about these courses please contact me. You were right in your prediction! !